This book is hilarious. If you have ever read a famous book you should read this. 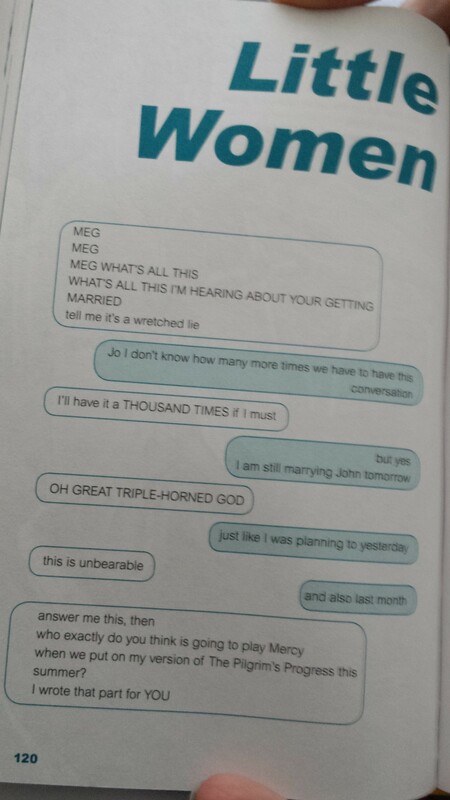 The premise is that characters from famous books (everyone from Medea to Ronald Wesley) are also texting each other. So you have Cathy and Heathcliff trying to outdo each others protestations of love, Hermione Granger explaining to Ron how credit cards work and nobody in Pride and Prejudice really having any idea who Mary is. Ortberg brilliantly captures the essence of the books and the characters, and they really are hysterical. Even E was giggling aloud at them, and she is not usually a giggler. I also have to do a shout out in particular for the Wuthering Heights conversation. I really loathe that book and the exchange completely captures why. The exciting news for you, dear reader, is that through the perils of double clicking on the ‘one-click’ ordering system, I actually have a spare copy to give away! So, we are going to have the inaugural Blogging Around My Bookcase Competition! To win this competition all you have to do is tell me which literary character you would most like to be able to text and why. The judging will be arbitrary, but I’m looking for interesting or funny or unexpected or thoughtful answers. Post your thoughts in the comments below. Competition closes at midnight (UK time) Saturday 7th Feb. 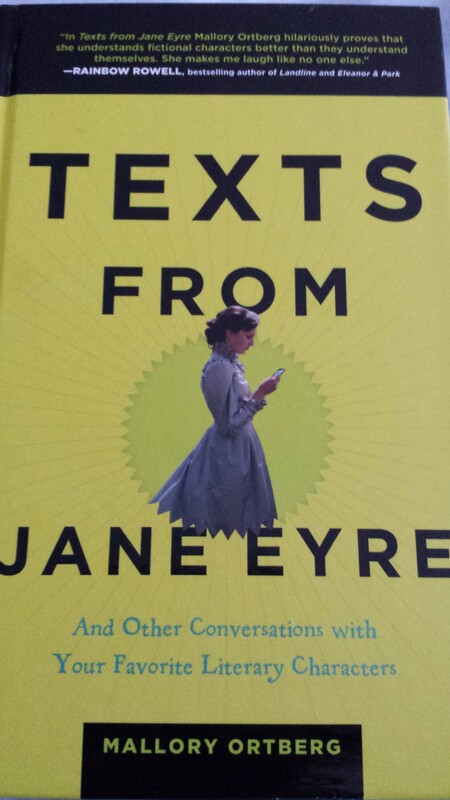 Tags: book review, books, Competition, Jane Eyre, Mallory Ortberg. Bookmark the permalink. Me to the NYPD: A guy’s just stolen The Goldfinch from the museum. NYPD: Can you describe him? Me: He’s perpetually drunk and obnoxious, and full of whining self-pity. I’d like to text the Hungry Caterpillar. I’d arrange a meeting. I’d lecture him about the value of proper nutrition and the need to instruct young people on the importance of healthy eating in early life… and then I’d tread on him, so I would freed from the thraldom of having to buy this book every time a friend has a new baby. Yikes! Could you not just buy a different book and leave the caterpillar to his salami? I would text Bridget Jones telling her to buy a copy of “It’s called a breakup because it’s broken” thus making savings on her phone bill to Daniel Cleaver, and avoiding a whole lot of tears in the bathtub. I would also advise her not to write any more diaries: 1 was great, 2 was wondrous, 3 was frankly too many. Sarah says Jeannette from Oranges. I reckon the twins from Mallory Towers, if Enid Blyton counts, just to see how they are doing. Or Hercule Poirot, although he probably wouldn’t like mobile phones. Or Viola from Twelfth Night. I would text Mr Tickle. Mr Tickle was my very first literary hero. I would congratulate him on his magnificently long arms, allowing him to achieve the feat which struck my much younger (and, tbh, current) self as so worthy of admiration: being able to reach down into the kitchen and open the biscuit tin without getting out of bed. How marvellous!! As to which literary character I would like to text, hmmn this is a tricky one. Not something I have so far ever pondered whilst reading a book, and there aren’t that many characters one would want to be friends/on a texting basis with (I am taking this too seriously aren’t I?). I’d certainly let well loved children’s fiction animals alone to enjoy their pages. I also like the idea of using texts to cut short some overly lengthy detective / or Thomas Hardy plots. A-level English could have been a lot less painful with some short interventions to Clym in The Return of the Native “Don’t marry her you fool!”, “10 minute warning: your mother is on her way! toiling over the heath”, “Quick, go and rescue her from that highly improbable adder”, and “why not go and live in Paris and have fun!”. Not sure I could have put up with his angst-riddled replies though.